Don’t be scared away by its bright, green color — this smoothie is super tasty, I promise. green tea = a nice caffiene kick! choice and a couple handfuls of your favorite green! Even though I have written up one of my favorite recipes, feel free to customize it to your own tastes! Add the above ingredients to a blender and blend until smooth. Add less green tea for a thicker smoothie. Wow talking about healthy, don't forget avocado is also one of those super foods so not only are they creamy and luscious but they have lots of vitamins and are good for your heart among other benefits ^_^. I will give this a shot with honey dew melon or cantaloupe or pears instead of apples. Ok I gave it a try first exactly like yours, well my brother gave it a try first and it was too much vegetable for his tastes so after making several versions we currently have our smoothies 1 part greens and 3 parts fruit. Honeydew melon or Pineapples are winners for us. With the pineapple we don't even need the green tea to get it all nice and liquefied since it has so much juice. That sounds so delicious! I love honeydew melon (it is so refreshing!). I have a bunch more green smoothie recipes where this one came from. 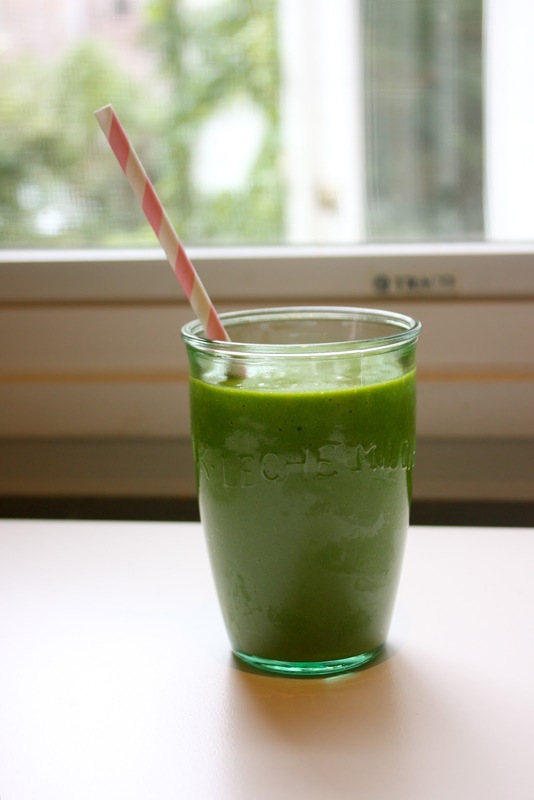 Another one that I really enjoy is the Glowing Green Smoothie by Kimberly Snyder! Sounds interesting! I'll have to give your smoothie a try.